Replacing old silver pennies due to the cost of the Napoleonic wars, which we won.This was worth about a million quid in those days. Well no, but you could go shopping with it and there would be loads of divisible bits to it. Halfpennies and farthings and half farthings. To the south east corner of Britains shield you may be able to make out the word SOHO. 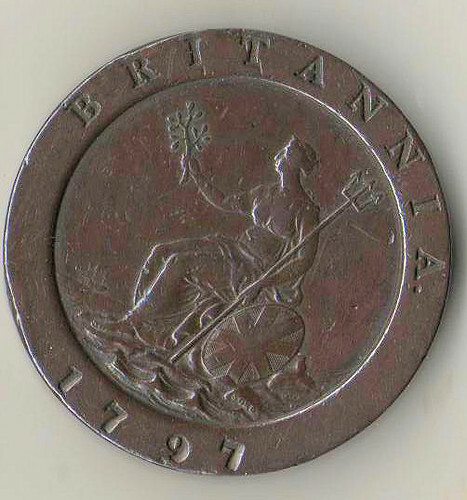 This is a mint mark and denotes where this coin was minted. Soho in Birmingham . By Matthew Boultons machine press. The olive branch held up by Britannia is symbolic of British patience despite provocation by foreign forces, this is probably the French.